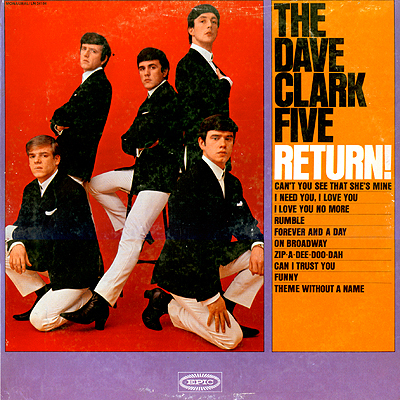 Album Cover Art - The Dave Clark Five Return! 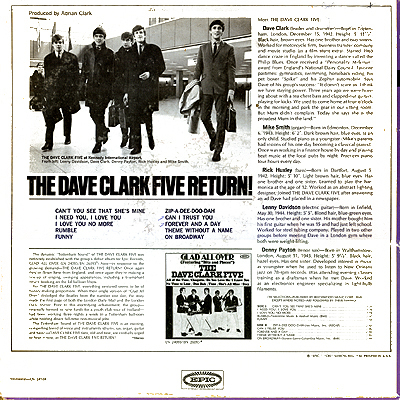 Notes: It was 1964 and the Dave Clark 5 were on a roll. Appearing once again on the Ed Sullivan Show they continued to ride the charts. They even managed to knock the Beatles out of the number one spot with their tune "Glad All Over". Coordinated outfits for the front cover shot while the back cover has the band arriving at JFK looking a bit more like bank tellers than band members. Title: The Dave Clark Five Return!